Bali Tropic Resort and Spa is a tropical retreat located near the beach of Nusa Dua. This resort is only 15 minute driving from Ngurah Rai International Airport. Besides that, other places like Bali Convention Center, Nusa Dua Beach, and Pasifika Museum are all close by. There are 150 air conditioned rooms which are provided by this resort. The rooms are all set in Balinese design and furniture creating the typical ambience of exotic Bali. These guestrooms at Bali Tropic Resort and Spa include minibars and coffee/tea makers. Also, Wireless high-speed Internet access is provided (with surcharge) in room or in public area. These accommodations provide in room safes, complimentary newspapers, and complementary mineral water replaced daily. The bathroom is provided by a comfortable bathtub and overhead shower. Additional amenities include hair dryers and trouser presses. 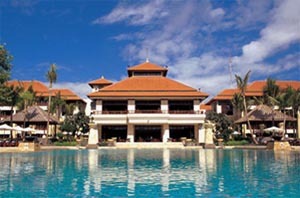 Bali Tropic Resort and Spa also offers other facilities like a health club, an outdoor pool, and complimentary bicycles. Public areas are equipped with wireless Internet access (surcharges apply). Dining options are available in a restaurant, a bar/lounge, and a snack bar/deli. Various kind of dishes are served from the experienced and professional chefs, guaranteeing a delicious dining experience. Guests are also served a complimentary breakfast for 2 people, or more with additional fee. The staff can provide concierge services, tour/ticket assistance, and tour assistance. Additional amenities include a rooftop terrace, a library, andan arcade/game room. Self parking is complimentary. Spent 12 days at the Bali Tropik in Sept. This was the second time for me and was not disappointed. The staff are wonderful and are always willing to help. The renovations and upgrades that have been done in the last nine years have really elevated the comforts of this location. Because of the small size of the resort, you are never very far from anything. Absolutely love walking on the beach and along the boardwalk. I would definitely recommend this resort to family and friends. Room Tip : I don’t think that there is a bad room.